[無料] Sim Daltonism | Mac App Storeのアプリ検索・ランキング BuzzMac! 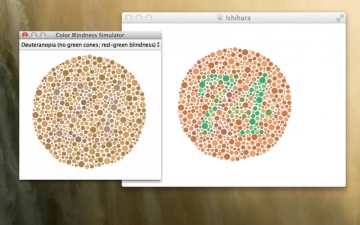 Sim Daltonism is a color blindness simulator. It filters in real-time the area around the mouse pointer and displays the result “as seen by a color blind person” in a floating palette. Complete or partial inability to distinguish colors. This color blindness is pretty rare. Complete or partial inability to see using long-wavelength sensitive retinal cones making hard to distinguish between colors in the green-yellow-red section of the spectrum. Complete or partial inability to see using middle-wavelength sensitive retinal cones making hard to distinguish between colors in the green-yellow-red section of the spectrum. This is the most common form of color blindness. Complete or partial inability to see using short-wavelength sensitive retinal cones making hard to distinguish between colors in the blue-yellow section of the spectrum. 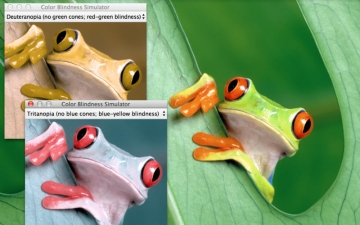 Note that I do not claim to have perfect or near-perfect color blindness simulation filters. This depends on correct screen calibration and other factors I cannot control. This application is offered freely in an attempt to allow myself and other to ensure web and other designs are usable by color blind people.